Nepal Highlight Tours | Adam Tours & Travel Pvt. Ltd.
Nepal is a beautiful country in the lap of Himalayas; its beauty is beyond the descriptions written and the photographs captured. Nepal has three distinct land regions in the short gap of 200Kms. Climate, Geography and the way of life is different in these regions. This is a 13 day trip of Nepal especially designed for maximum use of the available time. In this trip you will visit some places of religious importance in the Kathmandu valley like: Pashupatinath, swoyambhunath, boudhanath and others. Similarly, you will also visit historical Kathmandu durbar square which is enlisted in the world heritage site by UNESCO. You will visit Bandipur in the tanahaun district of Nepal which is a beautiful hill station. Then you will go to pokhara where splendid scenes of the mountains in the Annapurna Range, Phewa Lake and sarangkot are breath-taking. Then, you move on towards chitwan where you will explore the sub-tropical jungle of the chitwan National Park, see various wild lives in the National park. After a good visit of chitwan, you will visit one of the most importnant religious place of Buddhism: Lumbini. Lumbini is the birth place of Gautam Budhha: the light of Asia and Founder of Buddhism. Then we will move on towards Bardiya National Park in Bardiya where you will stay for two days exploring the beauty of forest, the way of life in tharu community and the cultural differences between different places in Nepal. Next, you drive from Bardiya to Nepalgunj and Fly back to Kathmandu. After your Arrival at Tribhuwan International Airport Kathmandu, our representative will welcome you and then you will be taken to your hotel. Our tour operator will explain briefly about the program. 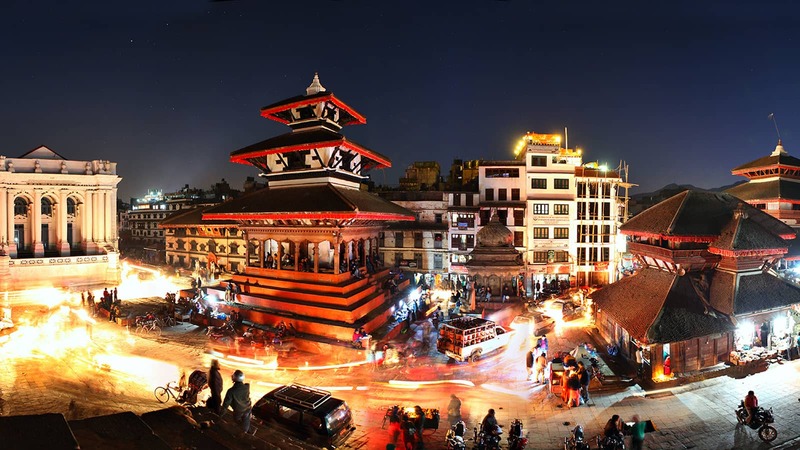 Depending on your arrival time in Kathmandu, you may explore “Thamel”. In the evening we host welcome dinner at one of the typical Nepalese restaurant with local music and ethnic dance. O/N Kathmandu. After breakfast, we will move for sightseeing tour in Kathmandu Valley; we will visit Pashupatinath, which is the famous Hindu Temple in Nepal. We keep visiting different places like stupa of lord Buddha which is the largest stupa of South Asia. We will visit to swayambhunath temple; this temple is lovingly called the ‘monkey temple’, for the innumerable monkeys that have made the temple their permanent residence. Swayambhunath is a stupa based on top of hill, from where we can generally view the scenery of Kathmandu Valley. and we will also visit Kathmandu Dubar Square. O/N Kathmandu. After breakfast, we will drive for Bandipur for 4 hours (144 km) from kathmandu.Bandipur lies in the Himalayan foothills of Nepal. Bandipur is famous for its natural beauty and another popular tourist destination. Bandipur is situated on a hilltop above the highway town of Dumre; Bandipur captivates the visitor with its cultural performances and wonderful scenery. Bandipur is a natural view tower where visitors can enjoy a spectacular panorama of the entire Annapurna Range also the peaks of Dhaulagiri, Manaslu and Langtang. O/N Bandipur. After breakfast, we depart from Bandipur and move to Pokhara approximately, it is two and half an hour drive (80 km). While moving from Bandipur to Pokhara you can enjoy the view of green mountains. O/N in Pokhara. After having Breakfast we will explore the pokhara valley, in the morning we will move to Sarangkot to have the beautiful view of Montain and after returning from Sarangkot we will spend our time along the bank of Phewa Lake, from there you can also view the amazing scene of Annapurna panorama. We will regularly visit the Seti River gorge, Davis fall , Binda basini Temple , mountain museum and cave of Mahendra Gufa. O/N Pokhara. After morning breakfast, we travel overland from Pokhara to Royal Chitwan National Park.After a short rest, visit to the Tharu village and the National Park Visitors Center. Sunset view from the riverbank. Dinner. Slide-show on the wildlife.O/N at Chitwan Park. O/N at Chitwan Park. After breakfast, you will have a full time for the safari activities, After breakfast, Dugout canoe trip followed by a Nature Walk Program or a visit to the Elephant Breeding Farm. Enjoy an ox-cart ride or a jeep drive back to the resort. After a refreshment you can wash the elephants and swim with them in the Rapti River. Lunch. Elephant back safari. Dinner. You will be entertained with Tharu stick dance and different cultural performances with the bonfire. Surely you will get a chance to have a lots of amazing photographs. O/N at Chitwan Park. Today morning you will go for Bird watching and after breakfast, we drive from Chitwan to Lumbini. Lumbini is the traditional birthplace of Lord Buddha. In Nepal, Lumbini lies in the foothills of the Himalayas. Lumbini is the wonder place to visit the different Buddhist temples and shrines from various nations could be finding there. The other main sight of interest at Lumbini is Ashoka’s pillar which is near the Maya Devi Temple. You will have a wonderful time with lots of beautiful scenery around there. There you will also find the ancient museum that is Kapilvastu Museum; with the lots of pottery, jewelry and ornaments in museum. O/N at Lumbini. After exploring lumbini we will drive to Bardia for 6 hours. Bardia is famous for Bardia Naional Park. After your arrival you will get a time to relax at Tharu(one of the tribe of Nepal who resides in Tarai region) bar or beautiful garden .Discover Tharu life and culture through our Tharu village and cultural tour. In the evening we will enjoy the cultural Program. O/N at Bardia National Park. After breakfast, you will spend your full day in Jungle activities and walking safari to view gangetic Dolphin-swimming if possible. O/N at Bardia. Things we do: Elephant back safari, Jeep Safari, Crocodile Breeding center & rafting. Today after breakfast we move towards for full day sight seeing program, we will be walking Half day for the exploration of Tiger territory and rest of the you will go for Elephant Back safari, jeep safari in Bardia National Park. we will go for fascinating visit to crocodile Breeding Center, the sights and sounds of real animal, if we got time we will Rafting. This trip might be one of the best trips to have a full picturesque view of the Bardia. O/N at Bardia. Today early we watch various Birds and if we get more time we will explore surrounding village, Jungle and Nature. After breakfast, we will drive to Nepalgunj airport for 2 hours (70 km) from Bardia National Park and fly back to kathmandu. Today you will take rest or explore the Thamel market during the day time.